Medical Reimbursement Scheme along with EHS is extended up to March 2018/ Medical reimbursement and EHS to run in parallel up to March 2018. GOVERNMENT OF TELANGANA - G.O.Ms.No. 6 Dated: 30-01-2018 :: Health, Medical & Family Welfare Department - Employees Health Scheme - Providing Cashless Medical treatment to the State Government Employees, Pensioners and their dependent family members - Extended up to March, 2018 - Orders- Issued. In the reference 15th read below, orders have been issued for implementing Scheme of reimbursement and the employees health scheme in parallel up to 31-12-2017. 2. In the reference 13th and 14th, read above, Government have issued comprehensive guidelines for providing cashless and qualitative treatment to the State Government Employees, Pensioners and their dependent family members and establishment of (14) Wellness Centers for Medicines / Drugs for outpatient investigation to the State Government Employees, Pensioners, Working and Retired and their dependent family members. Though these orders are issued and the scheme has not commenced in full shape. 3. Accordingly, Government after careful examination, hereby extended both the schemes of reimbursement and the employees Health Scheme to run in parallel up to March, 2018 or till further orders, whichever is earlier. GOVERNMENT OF TELANGANA:: HEALTH, MEDICAL & FAMILY WELFARE (A2) DEPARTMENT :: G.O.Ms.No. 110 Dated: 29-06-2017 ::-:: Health, Medical & Family Welfare Department – Employees Health Scheme – Providing Cashless Medical treatment to the State Government Employees, Pensioners and their dependent family members – Extended up to 31-12-2017 - Orders - Issued. 1. G.O.Ms.No. 174, HM & FW (M2) Department, dt. 01.11.2013. 2. G.O.Ms.No. 175. HM & FW (M2) Department, dt: 01-11-2013. 3. G.O.Ms.No. 176, HM & FW (M2) Department, dt: 01-11-2013. 4. G.O.Ms.No. 32, HM & FW (A2) Department, dt: 03-11-2014. 5. G.O.Ms.No.33, HM & FW (A2) Department, dt 13.11.2014. 6. G.O.Ms.No.36 HM & FW (A2) Department, dated 27.11.2014. 7. G.O.Ms.No.40, HM&FW (A2) Department, dated:1-12-2014. 8. G.O.Ms.No.26, HM&FW (A2) Department, dated:30-3-2015. 9. G.O.Ms.No.55, HM&FW (A2) Department, dated:27-6-2015. 10. G.O.Ms.No.112, HM&FW (A1) Department, dated:31-12-2015. 11. G.O.Ms.No.74, HM&FW (A1) Department, dated:8-6-2016. ORDER: In the reference 12th read above, orders have been issued for implementing Scheme of reimbursement and the employees health scheme in parallel up to 30-06-2017. 2. In the reference 13th and 14th, read above, Government have issued comprehensive guidelines for providing cashless and qualitative treatment to the State Government Employees, Pensioners and their dependent family members and establishment of (14) Wellness Centers for Medicines / Drugs for out patient investigation to the State Government Employees, Pensioners, Working and Retired and their dependent family members. Though these orders are issued and the scheme has not commenced in full shape. 3 Accordingly, Government after careful examination, hereby extended the both the schemes of reimbursement and the employees Health Scheme to run in parallel up to 31-12-2017, or till further orders, whichever is earlier. GO.181 Dt.30-12-16. Govt of Telangana,Health, Medical & Family Welfare Department, Employees Health Scheme, Providing Cashless medical treatment to the State Government Employees, Pensions and their dependent family members, Extended up to 30-06-2017. Govt of TS, G.O.Ms.No.181 Dated: 30-12-2016 Health, Medical & Family Welfare Department – Employees Health Scheme – Providing Cashless medical treatment to the State Government Employees, Pensioners and their dependent family members – Extended up to 30-06-2017 - Orders – Issued. 1) G.O.Ms.No. 174, HM & FW (M2) Department, dt. 01-11-2013. 2) G.O.Ms.No. 175, HM & FW (M2) Department, dt: 01-11-2013. 3) G.O.Ms.No. 176, HM & FW (M2) Department, dt: 01-11-2013. 4) G.O.Ms.No. 32, HM & FW (A2) Department, dt: 03-11-2014. 5) G.O.Ms.No. 33, HM & FW (A2) Department, dt: 13-11-2014. 6) G.O.Ms.No. 36, HM & FW (A2) Department, dt: 27-11-2014. 7) G.O.Ms.No. 40, HM & FW (A2) Department, dt: 01-12-2014. 8) G.O.Ms.No. 26, HM & FW (A2) Department, dt: 30-03-2015. 9) G.O.Ms.No. 55, HM & FW (A2) Department, dt: 27-06-2015. 10) G.O.Ms.No. 112, HM & FW (A1) Department, dt: 31-12-2015. 11) G.O.Ms.No. 74, HM & FW (A1) Department, dt: 08-06-2016. ORDER: In the reference 11th read above, orders have been issued for implementing scheme of reimbursement and the Employees Health Scheme in parallel up to 31-12-2016. 2. The issue of joining of some of the Hospitals in Employees Health Scheme is still under discussion. Hence there is need to extend reimbursement scheme to run in parallel with Employees Heath Scheme. 3. Accordingly, Government after careful examination hereby extend the orders issued in the reference 11th read above to the effect that both the schemes of reimbursement and the Employees Health Scheme to run in parallel up to 30-06-2017 or till further orders, whichever is earlier. GO.MS.No. 74 Dated: 08-06-2016: Health, Medical & Family Welfare Department - Employees Health Scheme - Providing Cashless medical treatment to the State Government Employees, Pensions and their dependent family members - Extend up to 31-12-2016 - Orders- Issued. 1) G.O.Ms.No. 174, HM & FW (M2) Department, dt. 01.11.2013. 2) G.O.Ms.No. 175. HM & FW (M2) Department, dt: 01-11-2013. 5) G.O.Ms.No.33, HM & FW (A2) Department, dt 13.11.2014. 6) G.O.Ms.No.36 HM & FW (A2) Department, dated 27.11.2014. 7) G.O.Ms.No.40, HM&FW (A2) Department, dated:1-12-2014. In the reference 10th read above, orders have been issued for implementing Scheme of reimbursement and the employees health scheme in parallel up to 30-06-2016. 3 Accordingly Government after careful examination hereby extend the orders issued in the reference 10th read above to the effect that both the schemes of reimbursement and the employees Health Scheme to run in parallel up to 31-12-2016 or till further orders which is earlier. 1) G.O.Ms.No.174, HM & FW (M2) Department, dt. 01.11.2013. 2) G.O.Ms.No.175. HM & FW (M2) Department, dt: 01-11-2013. 3) G.O.Ms.No.176, HM & FW (M2) Department, dt: 01-11-2013. 4) G.O.Ms.No.32, HM & FW (A2) Department, dt: 03-11-2014. In the reference 9th read above, orders have been issued for implementing Scheme of reimbursement and the employees health scheme in parallel up to 31-12-2015. 3 Accordingly Government after careful examination hereby extend the orders issued in the reference 8th read above to the effect that both the schemes of reimbursement and the employees Health Scheme to run in parallel up to 30-6-2016 or till further orders which is earlier. GO.MS.No. 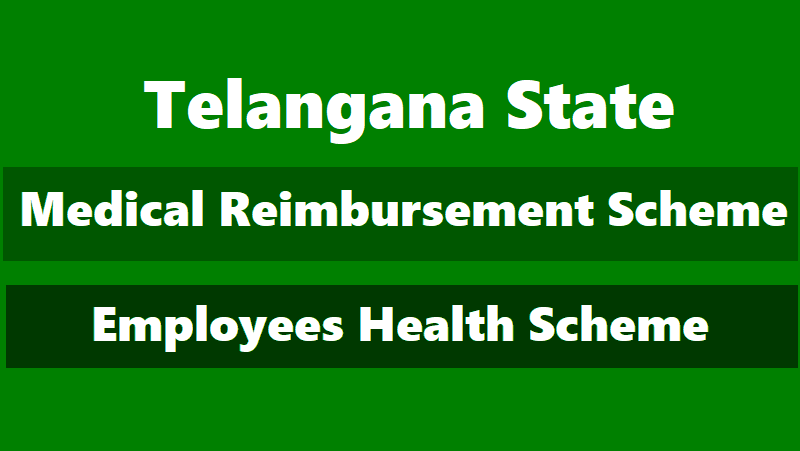 55: Dated: 27-6-2015: Government of Telangana State, Health, Medical & Family Welfare Department - Employees Health Scheme - Providing Cashless medical treatment to the State Government Employees, Pensions and their dependent family members - Extended up to 31-12-2015 - Orders - Issued. In the reference 8th read above, orders have been issued for implementing Scheme of reimbursement and the employees health scheme in parallel up to 30-6-2015. 3. Accordingly Government after careful examination hereby extend the orders issued in the reference 7th read above to the effect that both the schemes of reimbursement and the employees Health Scheme to run in parallel up to 31-12-2015 or till further orders which is earlier.